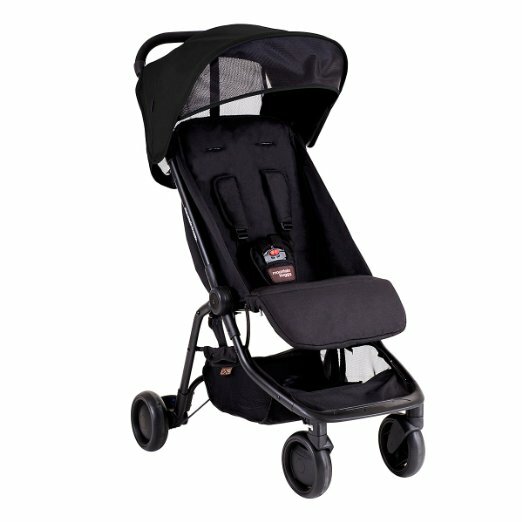 The Mountain Buggy Nano stroller is the top quality travel system strollers ever made! I’ve tested a lot of different stroller and I can tell you for sure that Nano beats them all when it comes to traveling. It’s super light, super compact, and you can even turn it into a travel system! As always, our review will start with the features followed by the pros, cons and then the final words. The canopy is definitely on the smaller side, but I guess it’s ok for an umbrella type of stroller. We really got spoiled with all the huge oversized canopies that go all the way down the bumper bar, so this one could definitely use some improvement. It also does not have a “follow-the-sun” option and is attached to the frame. There is a small pop-out sunvisor that is very small and doesn’t help much. There is no peekaboo window, but there is a mesh window in the back between the seat and the canopy that you can use to see your child. The seat is 13″ wide with 18″ seat back and a measurement of 26″ from the back of the seat to the top of the canopy. This is a VERY tall canopy that offers plenty of head room even for the tallest child. My friend’s 4.5 year old daughter was able to fit in just fine. Of course, you wouldn’t be able to recline the seat with a taller child on board because of the mesh in the back. The seat can accommodate a child from 6 months and up to 44 lbs. It has a strap recline that is doesn’t go all the way to the flat position, but is pretty deep. It has an adjustable padded 3 point harness with a center release buckle. The buck is AWESOME because you have to press the middle button and the sides at the same time for it to unlock. You smart toddler will never be able to figure it out. The down side of this is that you need to use both hands to release it. It has an adjustable leg rest that provides plenty of room for a little baby to stretch his/her tiny legs. There is a large mesh window in the back between the canopy and the seat back which provides great air circulation on a hot summer day. Unfortunately, there is no cover for it so your child will be exposed to cold wind on a chilly day. This is particularly incontinent for when the seat is fully reclined. I think a simple thin Velcro closure could fix this problem without adding too much weight. This is a great baby stroller to go for. Though the price is on the higher end, you will actually receive a quality product which will satisfy your needs for a really long period. You can depend on this product.